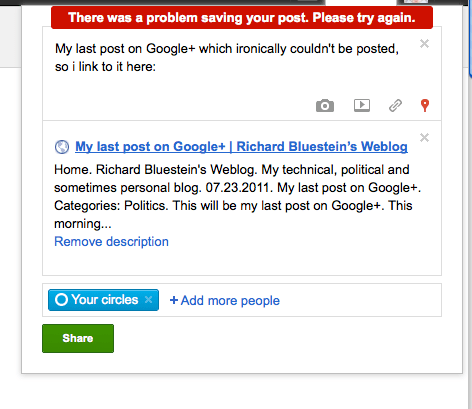 UPDATE: google+ would not allow this to be posted, ironically enough. This will be my last post on Google+. This morning google cancelled my account for an unspecified TOS violation. This would have been upsetting but not the end of the world. What was the end of the world, however, was that they also disabled my gmail account, and all other gmail services for my bloatedlesbianjew email address. Not only that, but they offered no opportunity for redress other than a silly comment form that nobody reads. They finally reactivated my gmail after several hours and me complaining to some very vocal tweeters such as Violet Blue and Skud, but the did so with no explanation, apology or anything. During the time, my email was blocked, gmail didn’t even send a bounce notification to the senders of my email telling them that my account was inactive. You can read my twitter feeed bloatedlesbian for more details but suffice it so say i no longer trust google with my data. I am furious with google’s negligence. I will come up with harsher words after I come back from a trip this weekend. At least I no longer have to figure out how to fit Google+ into my life. It doesn’t. Maybe it was just a glitch?